For this morning’s walk I headed out to Terra Nova Nature Park. I had sighted Barred Owl there recently. On starting out there was not much in the trails. Arriving at the center trail the Bushtits were all around foraging on the seeds on the dead tall grass. Carrying on from there I made my way to the gardens and crossed the road heading south around the trail. At the far end by the golf course I spotted the Barred Owl in my recent walk so I wanted to check it out. No luck today. Carrying on, the Great Blue Heron was sitting in the tree waiting to have its photo taken. 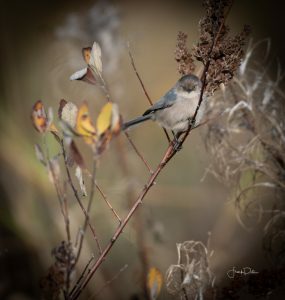 Just as I clicked the shutter it winked at me and took to flight. 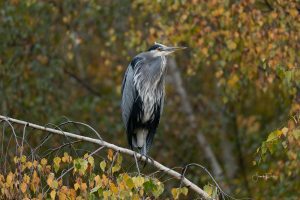 The great blue heron (Ardea herodias) is a large wading bird in the heron family Ardeidae, common near the shores of open water and in wetlands. I continued around the trail and headed back in to the center of the park. 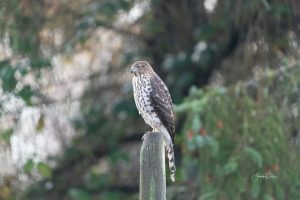 that’s when I noticed the Coopers Hawk in a small open area on a fence post. I slowly crept in towards it. I was able to get in to capture a few good images. It did not seem to mind me while it was looking at the ground for anything that moved. I headed back to my truck while enjoying the gorgeous fall weather.